How to video for building a bbq pit. 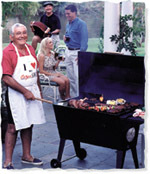 BBQ Bob has been working hard to find the best, baddest grills for Grillin’ Guys and Gals. Check out these grills made from automobiles, trucks, and even a motorcycle!